Tickets for The 2018 Celebration Bowl in Atlanta from Impact Tickets, LLC. 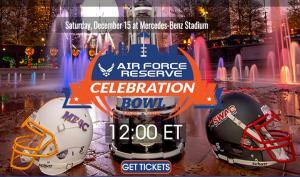 The Celebration Bowl is a postseason college football game featuring the conference champions from the Mid-Eastern Athletic Conference (MEAC) and the Southwestern Athletic Conference (SWAC). The event’s mission is to provide the schools, alumni, fans, and sponsors with a first-class bowl experience while continuing to celebrate the heritage, legacy, pageantry, and tradition of Historically Black Colleges and Universities. It is managed by ESPN Events. ESPN partners with The 100 Black Men of Atlanta to manage the game’s ancillary events, which include a Youth Symposium, Robotics Showcase, Gospel Night and Fan Experience. This year's event, held at Mercedes-Benz Stadium in Atlanta, is a rematch of the inaugural game with North Carolina A&T representing the MEAC and Alcorn State University representing the SWAC. Food and beverage included in the AMG Lounge or Suntrust Club for the $155 tickets. Tickets to games at Mercedes-Benz Stadium are MOBILE! THERE ARE NO PAPER TICKETS. YOU WILL NOT RECEIVE A TICKET THROUGH YOUR EMAIL!!! YOU WILL NOT RECEIVE A TICKET TO PRINT!!! All tickets are delivered via TEXT where you can add to your PHONE Wallet. While we do not advise it, but if you purchase multiple tickets and need to share with other family members, you may forward the text to them. When you arrive at the gate you should tell the ticket taker how many you are checking in. TICKETS SALES WILL END AT 12 MIDNIGHT ET!